Satisfy your big fat Greek appetite and watch the sponge boats bring their bounty back to shore in Tarpon Springs. The popular tourist-for-a-day destination is located on Central Florida's West Coast, along the Anclote River and just a short distance from the waters of the Gulf of Mexico. Situated just north of Pinellas County's award-winning beaches, Tarpon Springs has an overall average high temperature of 83 degrees Fahrenheit (28 degrees Celsius) and an average low of 63 F (17 C). Of course, Tarpon Springs has its own awesome beach—Fred H. Howard Park—although it is a little drive from the sponge docks that are so popular with tourists. If you're wondering what to pack for your day in Tarpon Springs, shorts and sandals are the dress code in the warmer months of spring and summer. Of course, its location on the water means that you'll want to wear slacks and add a sweater or light jacket for the cooler months. If you're traveling to Tarpon Springs during from June 1 to November 30, be wary of sudden tropical storms that are known to affect this area of the southeastern United States during what's known as the Atlantic Hurricane Season. Although Tarpon Springs is relatively sheltered and slightly more inland than other nearby cities and hasn't been affected by as many severe storms historically, you may need to evacuate in the event of a strong enough hurricane heading for the city. Be sure to check local forecasts before and during your trip so you're prepared for whatever severe weather may come. Considered the driest season, spring in Tarpon Springs is one of the best times of the year to visit. With average highs between 77 degrees Fahrenheit (25 degrees Celsius) in March and 90 F (27 C) by mid-June and little to no rain in the forecast each month, you're sure to find a few perfect beach-going days on your trip this time of year. The area only experiences an average of six to nine days of rain each month and a rainfall total of around 12 inches throughout the season, so you won't have to worry about staying dry if you choose to travel to Tarpon Springs in spring, especially in March and April. What to pack: If you're visiting in March or April, you can leave your raincoat behind and just pack a light sweater for chilly evenings or the occasional storm instead. Spring is also prime beach time near Tarpon Springs, so you'll want to make sure you pack your bathing suit, light T-shirts, sandals, and sunscreen (of course) if you plan to spend some time soaking up the sun. While the summer may be the warmest season to visit Tarpon Springs, it's also the wettest. If you visit during the summer months, you may get caught in a thunderstorm in the afternoon. However, these thunderstorms are usually short-lived, so duck into Hellas Restaurant and Bakery for lunch or a snack or dash into one of the stores to browse. Average high temperatures don't vary much across the season, staying above 90 degrees Fahrenheit (32 degrees Celsius) through September, and average low temperatures rarely dip below 72 F (22 C) throughout the summer. What to pack: You can leave the jackets and sweaters at home most of the summer, but be sure to pack a raincoat and umbrella no matter what month you're visiting—especially since the entire summer falls in the hurricane season. On sunny, dry days, you'll want to pack clothing made of light materials like linen or cotton, especially if you plan to do a lot of outdoor exploring. The rains continue into September but slack off by the end of October, and the temperatures stay steady until mid-November when winter starts creeping into the state. 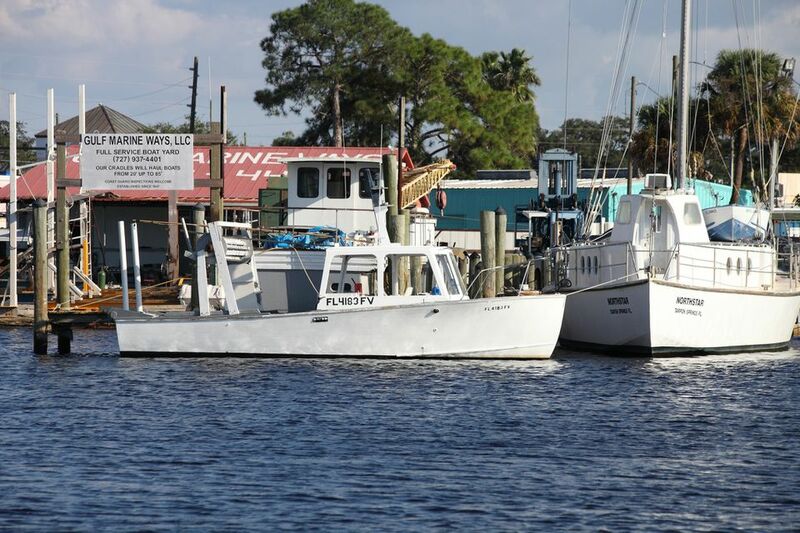 The dry, warm climate of Tarpon Springs this time of year make late fall another lovely time to visit, and since school's back in session throughout the region, you'll find the beaches and attractions less crowded. What to pack: While the rains fall less frequently, the temperature also drops consistently from mid-to-late fall, meaning you'll need to pack clothing you can layer to accommodate for the varied weather patterns. Be sure to pack a few long and short-sleeved shirts, a light sweater, a raincoat, an umbrella, sunscreen, a bathing suit, sandals, and water-resistant shoes so you're completely prepared for whatever weather may come. As temperatures continue to fall from mid-November through mid-January, the rains continue to lessen throughout the winter season. Although located in central Florida, Tarpon Springs sees mildly cold winters, especially at night; however, while nighttime lows dip to 50 degrees Fahrenheit (10 degrees Celsius) in January, the average seasonal high hangs somewhere around 73 F (23 C). What to pack: Long pants and a sweater might be necessary for the winter, but also, you should make sure to pack a warm jacket for those cool to cold winter nights, especially if you're taking a scenic or moonlit cruise. You may want to leave T-shirts and shorts off your packing list, too, but since unseasonably warm weather is known to happen throughout the region from time to time, you may also consider packing your beachwear just in case.